Chef Olaf Mertens’ culinary education began at an early age, when he was put to the task of stirring his Oma’s (granma’s) giant pots. Grounded in traditional German style, Olaf would become one of the ambassadors of the New German Cuisine. His family emigrated to Canada from Germany when Olaf was young, settling in Mississauga, Ontario. Olaf knew early on that he wanted to become a chef. At 18 he started an apprenticeship in his native country’s finest culinary academy. He earned the honor of Top-Skilled Apprentice for 1989 and in the same year was named Berlin’s Apprentice of the Year. Returning to Canada, he put his new skills to work at Rogues Restaurant in Mississauga, and led it to become one of Canada’s top restaurants. To further refine his skills, he took on the challenge of the grueling Küchenmeister course at the Steigenberger hotelier school in Bavaria. Olaf Mertens still likes to go back to Germany frequently, and makes it a point to stay in touch with fellow chefs in his native country, exchanging ideas and sharing what inspires and drives them. Chef Olaf also has a very strong bond with his Mississauga hometown community, where he is proud owner and executive chef of three “HIP” restaurants: On the Curve Hot Stove & Wine Bar, Ten Restaurant & Wine Bar and West 50 Pourhouse and Grille. He also runs a catering service which he calls Catering…from the HIP. (HIP is Olaf’s acronym for ‘Hospitality Inspired People.’) As captain of Team Canada in international culinary competitions, Chef Olaf Mertens led his talented chefs to win two consecutive silver medals in Limerick, Ireland and Dallas, Texas. 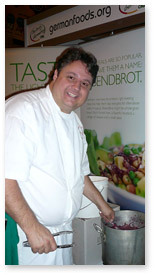 Olaf has appeared on the Food Network’s ‘Summers Best’ series, and as guest chef on television and radio. He has published two cookbooks, Cooking from the Hip and Olaf’s Kitchen: A Master Chef shares his passion. Served hot or cold, sauerkraut is great all on its own. Add a little cream an a few special ingredients, and you end up with love on a spoon. Chef Olaf’s Oma (grandmother) always made this dish with dumplings. This combination of savory, sweet and sour is to die for. You’ll need to start this meal the day before you serve it, as the ribs marinate for twenty-four hours. A fantastically flavorful variation on a seasonal favorite. Baked apples with a filling which combines bold and warm flavors, adding some adventure to a great comfort food. Nic Prong, a young head chef at Chef Olaf’s Ten Restaurant, came up with this unbelievable bowl of gooey chocolate indulgence. Enjoy! This recipe is Chef Olaf’s own leap of faith. He’s combined chocolate and sauerkraut to make a cake for any adventurous soul ready to think outside the box and try different things. Once you’ve tried this recipe, it might just become your favorite way to prepare Spaetzle noodles. Double-smoked bacon, Black Forest ham and Emmental cheese make this casserole a complete meal in itself. Fresh chives and parsley add color and depth. Not your average kraut! Chef Olaf uses double smoked bacon to give the dish some depth, and adds fresh apples and more to balance the natural acidity of the sauerkraut. A dash of spices rounds off this great kraut-pleaser. The wonderful spice mix Chef Olaf custom-blends for this red cabbage recipe is reminiscent of German gingerbread spice (Lebkuchengewürz) and transforms a fairly simple dish into the epitome of comfort food.